Havana is exploding in popularity now, but it’s a tricky city for tourists to navigate. There’s no internet access on mobile phones and very limited public wifi, which means you have to come prepared. On our trip, we relied almost exclusively on own custom map that included recommended restaurants, must-see attractions, museums, and more. 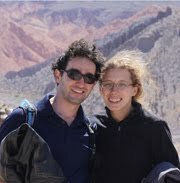 It proved much more valuable than the guidebooks we had brought along. Our map is available to any aspiring Cuba traveler. You can view the high-res version below. We brought our printed map with us because internet access is slow, unreliable, and expensive, and the Google Maps app does not allow Cuba maps to be downloaded offline. We also preferred consulting a few sheets of paper versus pulling out an entire guidebook. So please print out or buy a map before you go! 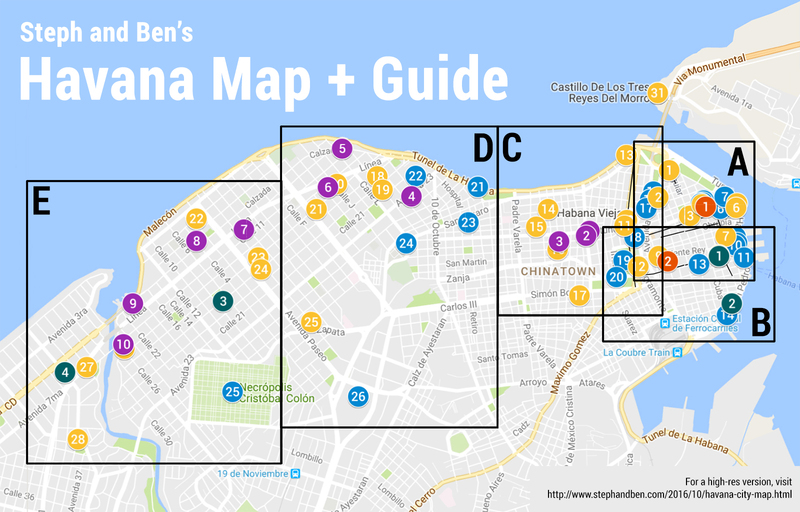 Our map combines information from a wide array of sources (English-language guidebooks, Spanish-language restaurant sites, Cuba travel blogs, etc). In particular, we put a lot of effort into finding places where we would want to eat —where to eat lunch in Havana Vieja away from the crowds, where to go for a special dinner, where to grab a drink with the best views over the Malecon, and so on. Cuban cuisine doesn’t have the best reputation, but we followed our map and we ate really well. Sights: It lists the major sights in Havana Vieja along with a brief description. 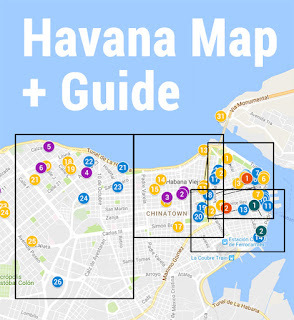 I’d recommend bringing along a Havana history guide to learn more about specific locations. Museums: It lists the major Havana museums, most of which we found to be worthwhile. Restaurants: This is where our map shines. We present a carefully curated list of restaurants and include sample dishes, decor, and contact information. We include must-visit culinary destinations and fallbacks, for when its 2pm and you're starving. Tourist traps: We’re not really into following the tourist hordes so you won’t find Bodeguita del Medio on our map (you’ll know when you’re there because of the throngs of people gathered outside at all hours). You can download our map below. We put a lot of time into making the map, so if you find it useful, please consider paying (whatever you think it's worth). But most of all, we want you to enjoy the map and your trip. We loved Cuba and hope you will too. If you spot any errors in the map, please let us know in the comments. Note: Direct flights to Cuba are now available from the United States. Travel restrictions for U.S. citizens are still in place, but travelers claiming the people-to-people license no longer have to travel as part of an approved tour group.